The first full week of the New Year has been a very hectic week for so many people. Here’s a great idea to make life a bit easier – make one big pot of very versatile veggie soup to enjoy the entire weekend. What makes this recipe unique is that we sauté the veggies first which adds depth of flavor that you don’t usually find in veggie soup. Even picky eaters love this soup. This recipe can be made stove top or in a crock pot and freezes beautifully in single or family size portions. 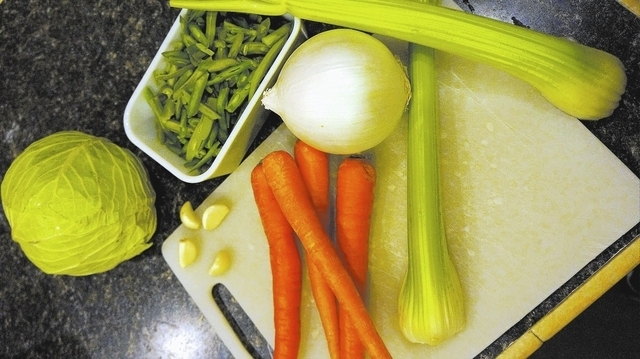 Be sure to have everything chopped and ready before you begin cooking. This delectable soup makes about 8 servings in my house or 12 in a normal home. To avoid the “soup again?” syndrome, you can make the variations below to totally change up the flavors. To help with those New Year resolutions, a cup of soup before a meal can help you eat less while getting your five vegetables a day. The secret to this soup is the sauté. Put 1 tbsp. oil in a large soup pot on medium-high heat. Add onion and cook until nearly translucent. Add carrot and sauté for three minutes. Add celery and continue to cook for another three minutes. Remember, you’re not totally cooking these, just sautéing for the great flavor it imparts. Add the garlic and mix it together for about one minute. Add cabbage and mix. Add a little salt and pepper now. Cook until the cabbage wilts. To finish on the stove top; let this come to a boil then turn heat down to low. Let this bubble away until the veggies are tender and the soup smells divine, roughly 30 minutes. Add salt and pepper to taste at the end because as the soup reduces it concentrates the flavors including salt. You can replace half the broth with water to reduce the sodium. Of course you can add any veggies you like to this soup but I concentrated on lower carb veggies. Variations – Change the flavor by adding these ingredients to the hot soup, by the bowl or small pot. Mock Minestrone – White beans, big handful of spinach, cooked pasta and parmesan cheese. Cabbage Roll – Cooked hamburger, rice, and a splash of Worcestershire. Finish with a dollop of sour cream. Southwest – Add shredded cooked chicken, black beans, corn, and a dash of cumin and chili powder. Top with shredded cheese.